The above image was posted in 1908. 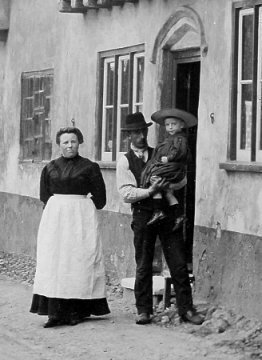 Edgar Wright & family c1910. The house is given as the BEAR in the 1851 census. Advertised For Let, March 1886. An Old-Established Wheelwright's Business having been carried on for the previous fifty years. Advertised September 1900 as being available To Let with possession from 11th October. With large Garden and about Two Acres of Land. Apply Bidwell & Sutton, Thetford. Property sold to (Charles ?) Barrett 1921. Not identified in Kelly's 1922 directory. Except the large tree is gone. 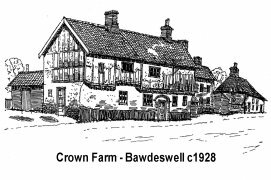 The 1841 census does not name licensed premises but the route of the enumerator along the Street, from the direction of the Reepham Road, first gives (Page 12) James Brown, Innkeeper (Named at Ram in 1845), then (Page 14) William Barrett Publican, at what should be the Crown. 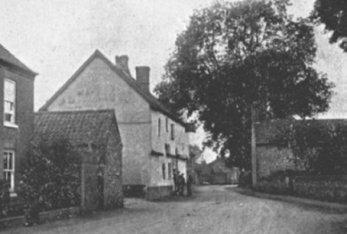 Robert Utting (Page 15) is given further along the census return as a Wheelwright at what appears to be the Black Horse, a beerhouse. 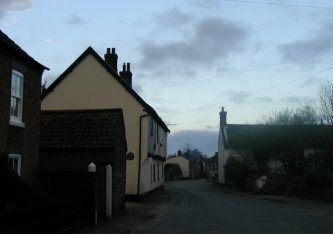 Finally (Page 20) Thomas Sturley is named as Innkeeper at what would be the Bell, with the location given as the Slade. The complication is that William Barrett is given at a beerhouse in 1836 and 1845 (Black Horse ?) and Robert Utting is named at the Crown in the same years. that shortly after visiting the house of William Barrett, the enumerator arrives at the Slade. This suggests that several houses were missed on the first sweep along the street. It seems likely that the public houses, and other dwellings were visited out of order. Perhaps the enumerator stopped in each licensed establishment, had a tipple and got confused ?? ?